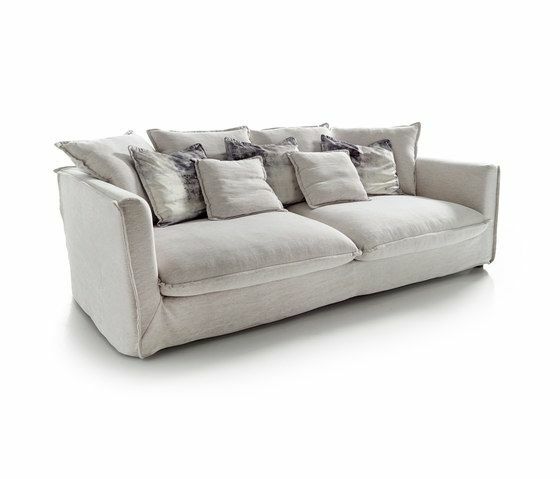 A different sofa, complex in terms of its concept but with an impeccable result. A classic soul translated into a contem- porary language through the use of line and shape. A stimulating exercise exploring the formal art. In the execution resides its soul, and comfort is its language. A sofa in casual, Bohemian and stylish look. Removable sofa. MATERIALS 1. Solid wood frame, covered with HR30 and HR34 kg/m3 foams. Suspension made with Nea elastic webbing with 10 year guarantee. Internal protective cover of foamed silicone fibre. With removable upholstery. 2. Seat cushion main block made with HR 35 kg/m3 foam of soybean oil. Covered with a cotton cover filled with microfibers made of 60% down touch padding plus 40% of polyester silicone fibre. 3. Backrest cushion with internal cotton cover with multiple cells, stuffed with microfiber, made of 60% down touch padding plus 40% of polyester silicone fibre. 4. Hidden leg of solid wood.